Is there such a thing as list of available DBus services? I've stumbled upon a few (like those provided by NetworkManager, Rhythmbox, Skype, HAL). I wonder if I can find a rather complete list of provided services/interfaces. You can also use DFeet if you prefer a GUI tool. The python way is the beautiful way. I don't usually do this, but is a nice trick to keep on sleeve. I use gdbus for introspecting and proving concepts before moving to code. The bash completion saves a lot of typing and avoid typos. Would be nice to have gdbus displaying a nicer output. Not the answer you're looking for? 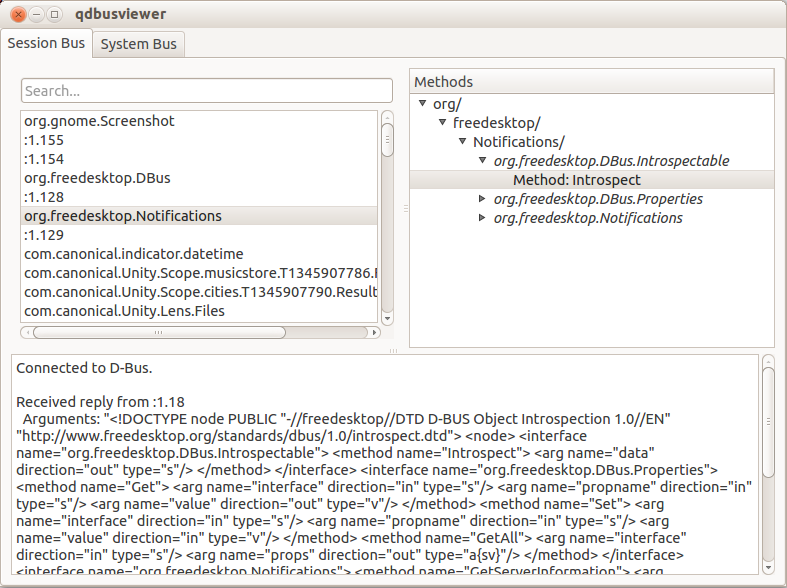 Browse other questions tagged linux d-bus ipc or ask your own question. Can libnotify be used to execute a script?